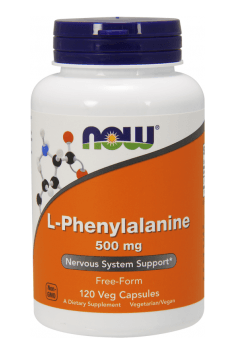 Now Foods L-Phenylalanine is a dietary supplement containing 500 mg of L-phenylalanine in one capsule. Phenylalanine is an exogenous amino acid (indispensable), which means that it is not synthesized by the body, and must be supplied with food. It belongs to a group of 20 amino acids encoded by the DNA, that are the fundamental building blocks of most naturally occurring proteins. In the organism, it performs its role primarily as a precursor to other amino acids – tyrosine and a psychoactive compound – phenylethylamine (PEA). As the precursor of tyrosine, it affects the production of thyroid hormone, melanin (skin pigment), neurotransmitters (dopamine, noradrenaline and adrenaline), and plays an important biological role as an intracellular relay. Phenethylamine (PEA) is a natural compound found in the human brain, where they may act as a neurotransmitter. It is suspected that this is the substance responsible for so-called "runner’s euphoria", manifested by a mood improvement, and increased strength and immunity to pain. There is speculations that the PEA contained in the food would have psychoactive effects, if there was not the fact that after getting to the digestive tract it is rapidly metabolized by the enzyme MAO-B, which prevents it from reaching in a large amount to the brain. On the contrary, phenylalanine is very well absorbed in both the blood and effectively crosses the blood-brain barrier, by increasing the level of PEA in the cerebral structures. Phenylalanine is necessary for proper operation of the nervous system. Can be used as an appetite suppressant, and also has some analgesic, antidepressant and slightly stimulant potential. Take one capsule 1-3 times a day with a meal or consult a specialist about the dose. It can be used to stimulate thyroid hormone production, decreased appetite, improve the neurotransmission, and also as analgesic.